Well, as previously noted, my whole ‘getting back into blogging after handing in the thesis’ resolution went the way of all things aka it quietly decayed before its time like trees broken by a storm or something I’m sorry I’ve been teaching about Milton today sometimes this happens. I handed in my thesis a few months ago and since then have been in the odd no-man’s-land between submission and examination. It’s a bit like the time between Christmas and New Year, except that you don’t get to spend it watching Elf and working your way through a selection box. (Well, I did spend some of it watching Elf and working my way through a selection box. My father wraps up Cadbury selection boxes ‘from Santa’ for my sister and me every Christmas, despite that fact that at time of writing we are, respectively, 26 and 29 years old, because he is an adorable human being. When I was a child I was unnecessarily Charlie Bucketesque about it and kept my store of chocolate going till Easter, but now I am a ravening hellbeast who ate it all in a few days, and then bought another Wispa because I had forgotten how nice Wispas are). Maybe it’s best to reflect on the PhD experienced straight after submission, when it’s all still fresh. Um, Kirsty, you appear to be… just blinking a lot. And saying ‘Ohgodohgodohgod I bet it’s full of mistakes ohgod’. Right. Maybe give it a couple of days… Oh. You’re in a pub. You’re in all the pubs. That’s the sort of dedication a PhD demands, I guess. Perhaps in a few weeks, then, when it’s all sunk in and you’ve had time to – hang on, where has the time gone? That’s months, just – you’ve been teaching? That’s not much of an excuse – well, fine, OK. So it’s been months, Kirsty, and by now you must have some clear opinions on how to do a PhD. 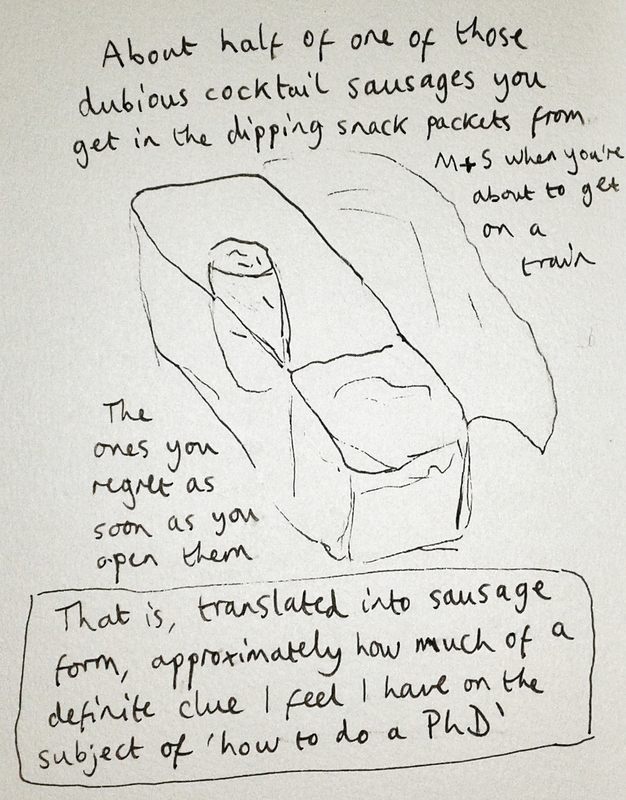 Not a chipolata. Or not much of one, anyway. My thesis is a big blue book, a copy of which sits on a shelf downstairs. How I feel towards that big blue book is sort of indicative of how I feel about the whole damn ridiculous-and-occasionally-awesome circus of making it: it’s simultaneously unworkably giant (it is a very big blue book. Suitable for pressing flowers or dropping on the heads of invading armies) and weirdly small (I spent four years on this! It should be more impressive somehow, surely). This is all by way of being ridiculously lengthy preamble to a fairly practical thing. One day in the indeterminate future I might write a halfway-serious post about the stupid stress of finishing a thesis, or indeed the precipitous emotional tumble that I – and I think quite a few people, though by no means everyone – found was waiting for me afterwards, like a treacherous kink in a slushy halfpipe (I have been watching the Winter Olympics. I have a deep and abiding weakness for any sporting championship that involves lots of different events I know basically nothing about. I have never been skiing, did one unsuccessful snowboarding lesson on a dry ski slope as a teenager, and the closest I’ve ever been to the sparkly gorgeousness of figure skating is probably going to the ice rink next to the Toys R Us in Plymouth while wearing jeans I’d customised with multicoloured sequins, at some point in the late 90’s, when people did that kind of thing to jeans. Anyway, how about that halfpipe?). That says ‘shoes’, not ‘shots’. I was sadly never in the habit of concealing shots of alcohol in the hems of my voluminous jeans. Frankly, though, that’s not a thing I’m up for right now, because hells no. But I did have a realisation the other day, while talking to a student about the pitfalls of keeping track of an argument: I made a plot of my thesis towards the end of it and it was basically the best thing I did. Well, what we had here was a failure to communicate. I’m traditionally better at communicating when I write stuff down, so I decided to make a big plan of the whole thing. I entitled it ‘Thesis chapter breakdown’, which coincidentally is also an emotional phenomenon that turned up a few times towards the end of my writeup – a phenomenon that, I found, my Big Damn Plan was really helpful for avoiding. Or limiting, at least. The day or so I spent carefully breaking down the arguments of my chapters was pretty much the most useful time I spent during the whole four years, and then once I had the plan it I felt less like I was floundering around in a big mess of words and more like I was making a formed thing. I mean, obviously I beat myself up because I spent a day not writing in actual chapters, but I am an idiot. In fact, I wish I had made one of these much earlier on and adapted it as my project changed. Most of of the PhD advice I’ve ever given has started with ‘Hah, don’t do this thing I did…’ but I wholeheartedly endorse the making of a Big Damn Thesis Plan. EDITED TO ADD: discussing this on Twitter has reminded me of something I should really acknowledge at this point – that this big picture stuff is really difficult. Both practically – theses are long – and psychologically. By the point I came to make my Big Damn Plan my thesis felt like a big smog of words I couldn’t see my way out of. I sat in the Rare Books Room at the BL and forced myself to write the plan whilst basically flipping out, like I had intellectual vertigo – this is why it took a whole day – and then felt so much better once it was written down. There’s the tough bit of my advice, I guess: breaking down your argument, especially when dealing with stuff you’ve already written, can be really difficult but is absolutely worth it. I can’t overstate how useful this was to me, both in terms of actually practically working out what to write, rework, and cut, and in terms of making me feel more in control of my material. Download it! Use it! Adapt it! Add more chapters if you are doing more (I wrote very long chapters). Don’t write the chapter planned in this example because it does not advance scholarship in any way I can think of! Hopefully it’s fairly self-explanatory, except maybe for the bold/not-bold text in the final column – the bold is the basic scope, and the not-bold the actual pithy bit of the argument I want people to remember. So essentially that was my big thesis-writing discovery – and I wish I’d started planning/keeping track of writing like this sooner (while writing undergraduate essays, frankly). I hope it helps some people – and I’d love to hear any tips about this sort of thing! Obviously this is a pretty arts and humanities focused model, so any advice as to how I might make this more useful for people in other fields would be much appreciated, too. 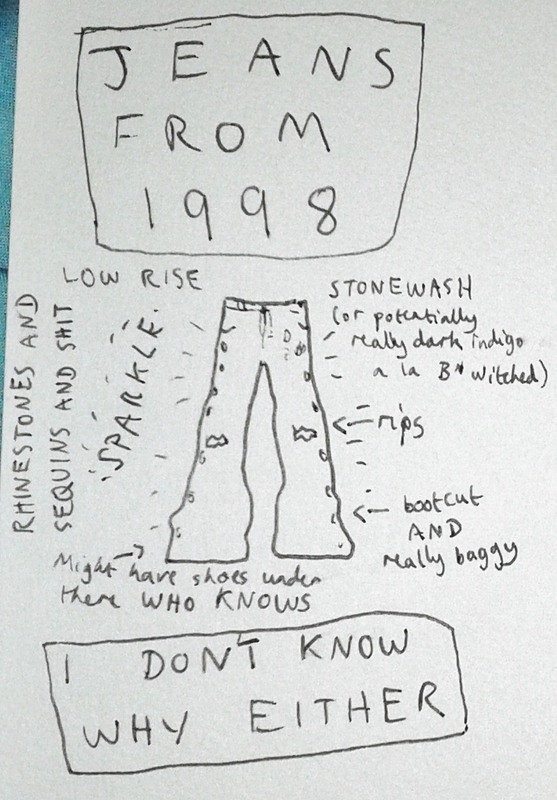 This entry was posted in Kirsty rants about PhD stuff and tagged 90's jeans, also I have had the Channel 4 'Gay Mountain' song in my head for like a week, Big Damn Plan, PhD advice, planning, sausages as a unit of knowledge, snowboarding, thesis. Bookmark the permalink. I think it’s wonderful. My best writing was always when i just wrote unplanned, but doing this would have saved many times, i mean, essays. This is excellent – thanks, complete aversion to plans until PHD. Love that you found ALL the pubs. Is finding all the pubs essential to my work?